Mobile Health Computing: What's Your Favorite Gadget? I love gadgets. I blame that on my MIT education. I just fell in love with technology at MIT. That's why I like to write about medicine and technology. What's your favorite gadget? 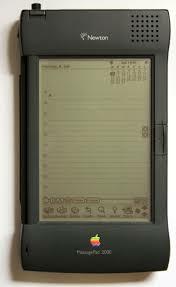 I'd have to say that my favorite is the Apple Newton Messagepad 2100. Why? Because it was so innovative for its time. It had a processor that was much faster than most processors found in laptop computers. Plus, the handwriting recognition was unbelievable! It used standard AA batteries, so I even traveled to China with my Newton because I knew that I wouldn't have any problems finding AA batteries. So, what's your favorite gadget? I'm willing to bet that many young people would say the Apple iPhone. Some may even remember the days when Sony came out with the original "Walkman" (yes, I had one of those). My favourite gadget is a Newton as well. In fact I have kept mine going as my day to day PDA since discovering the Apple Newton in 2002. Despite the introduction of the eye phone, there is nothing on the market that it matches the Apple Newton's ability to allow a business professional to produce information quickly and easily. If it wasn't for the fact that the Newton did not support Microsoft office Adobe Acrobat files I would use it to replace my laptop without any hesitation. I was reading a blog on the Microsoft developers site the other day explaining the latest exciting developments in the user interface for those who want to use handwriting recognition in Windows 7. After reading that, I realised that Apple Newton users have got it good. It was interesting to see that some of the new editing gestures that they were intending to introduce looked uncannily like those applied on the Newton. Have you kept abreast of Apple Newton developments? Do you have a collection of abandoned medical/health applications which could be up loaded to UNNA?